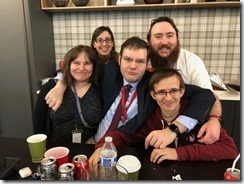 Brady Gaster helps to build and coordinate many of the Azure demos you see on stage at large technical conferences. He talks about how his team tells a story with tools and code. I have read a lot of biographies in my life and many of those focused on the lives of U.S. presidents; but it's rare for me to read a book about a sitting president. 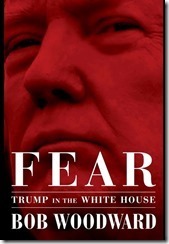 I made an exception with Fear: Trump in the White House - partly because it was written by Pulitzer Prize winner Bob Woodward, whose books I've always admired; and partly because Donald Trump's presidency - on which this focuses - is different from any other presidency. So less than two years into his term, I am reading about Trump's ascent to power. Woodward describes some of the positives of the Trump presidency. For example, he spends a lot of time discussing a decisive and successful strike on a Syrian air base in response to Syrian President Assad's use of chemical weapons on children, in violation of international law. But Trump supporters will probably not remember the positive coverage, because there are so many unfavourable descriptions of the President. After the first third of Fear, Woodward's descriptions of Mr. Trump are largely unflattering. The title of the book comes from a Donald Trump quote: "Real power is fear. ", a sentiment he has expressed multiple times. Entering the White House, Donald Trump had very little understanding of the most basic principles of economics or policy or politics or governing. For example, he repeatedly suggested that printing more money was a viable solution to the deficit. Worse, Trump had no interest in correcting his misconceptions. After trying unsuccessfully to educate Trump on the fact that the U.S. had years ago moved from a manufacturing-based economy to a service based economy, a frustrated advisor asked the president "Why do you have these views?" to which Mr. Trump replied, "I just always have." He displayed similar ignorance and stubbornness in other matters. He repeatedly insisted to his advisors that the U.S. should not spend money defending other countries and resisted the argument that doing so was an investment in American security. For example, forward-positioned American troops in South Korea reduce the alert time of a potential North Korean nuclear launch from 15 minutes down to 7 seconds. His generals and economic advisors praised this as a good investment. Despite this, Trump would raise the issue every few months, arguing that the U.S. was wasting money in South Korea. He repeatedly insisted on huge increases in tariffs, despite advice from his economic advisors that doing so would damage the economy. Donald Trump takes pride in his decisive action, but he often does so without seeking advice or ignoring expert advice. He pushed hard for withdrawing from Paris Climate Accord with little consultation about the legality and impact. He declared via Twitter that transgenders would not be allowed in the military - a major policy decision that broke a campaign promise and defied existing laws. He justified it by grossly overestimating the cost and impact transgender soldiers had on the military. The military refused to enforce this ban and it ultimately failed after an expensive court battle. In choosing his advisors and staff, Donald Trump values personal loyalty to Donald Trump over experience, intelligence, or other qualifications. Once hired, he ruled his people by intimidation and bullying, often publicly insulting his staff. He took delight in setting one staff member against another. The result is an abundance of infighting within the White House, which made it difficult for everyone to act in a unified manner. The advisors in the administration do everything in their power to mitigate Trump's worse impulses. Since reasoning often fails, they often deliberately delayed executing on a directive or they stole papers from the president's desk to prevent him from signing an order or even thinking about it. This worked because the president's attention span is short, and he has no list of things to accomplish - neither on paper nor in his head. When a paper was removed from his desk, he often did not miss it. In one of the lowest points in the Trump presidency, the president refused to condemn Nazis and Klansmen marching in Charlottesville, VA, chanting racists slogans, such as "Jews will not replace us". Trump's initial response placed blame "on both sides". His advisors finally convinced him to deliver a speech a few days later, explicitly condemning the white supremacist groups; but Trump almost immediately regretted doing so, complaining that it made him look weak. A few days later, he reverted to his equivalency argument stating there were "very fine people on both sides". His handling of the incident drew praise from Ku Klux Klan leader David Duke and almost universal criticism from non-racists in both political parties. The president's pre-conceived notions (often based on ignorance), his poor listening skills, and his frequent refusal to consider opposing viewpoints often made life frustrating for his advisors, many of whom left shortly after taking the position. Not surprisingly, Donald Trump himself declared the book "fake", even without reading it. And Trump supporters often close their mind to anything critical of their hero, labeling any criticism - fair or otherwise as "fake news". But several things reinforce the credibility of this book. One is Woodward's reputation: He has won two Pulitzer Prizes and has written critical of public figures in both major parties. The other is that the picture Woodward paints of the president in private is consistent with the image Trump projects through Twitter and his rallies. He has never shied away from personal attacks or name-calling; he frequently overstates his own abilities in speeches, claiming to be the best in the world at multiple skills; and his closest associates have publicly attacked on another. Woodward conducted hundreds of hours of interviews for this book. He does not identify many of his sources, but it's not difficult to guess some of them, particularly when he reports on a private conversation between Trump and one other person. Woodward requested an interview with the president, but never received a reply. The author writes in the straightforward style of a professional journalist. Woodward seldom asserts his own opinion. Instead, he quotes the opinions of others in the administration. Woodward closes the book with a disagreement between Trump and his lawyer about whether the President should testify as part of Special Prosecutor Robert Mueller's investigation into alleged collusion between the Trump campaign and Russia. Trump insists he would be an excellent witness. His lawyer tries to tactfully discourage Trump from testifying (he even threatens to resign as his lawyer) because he knows that Trump is a habitual liar and will almost certainly commit perjury during any sworn testimony. As I write this review, my hope is that Donald Trump will notice it and label me an enemy, as he does with so many who disagree with him. I was in a period of transition last week when the account rep asked if I could travel to London Monday to meet with a customer. A re-org had been announced a few days earlier and I had not yet met my new manager. Following numerous e-mails, meetings, and calls, it was decided I should make the trip. So, I found myself on Thursday afternoon purchasing an international ticket to leave for England Saturday afternoon. 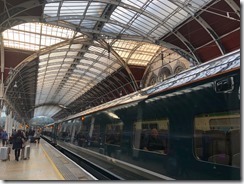 Many who know me are surprised I had never visited the UK, given the amount of travel - both domestic and international - that I've done the past few years. But I was excited for my first visit. I arrived at London's Heathrow Airport early Sunday morning, expecting to spend the day exploring the city. Unfortunately, a sleepless transatlantic flight meant that I spent much of the day in bed. I did manage to connect with a couple expats living in London, so I had lunch with James, who moved here from Ohio a few months ago; and dinner with Tobiasz, who moved to England from Poland a couple years ago. On Monday, I also managed to connect with Andy, whom I had known for a few years from our participation in the IT Camp in Transylvania. He joined me for lunch, where I experienced the delight that is English meat pie. It was good to see friendly faces in a foreign country. But I came here to work, so I met with the customer Monday, where we successfully brainstormed potential projects on which we could work together. It was good that I came, and I went to dinner with a couple other Microsoft folks afterward to experience the delight that is fish and chips and English beer in an English pub. 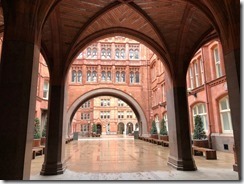 I had Tuesday to myself, so I opened the day with a guided walking trip around London. The tour was well worth my time and money. Sights included Buckingham Palace, St. James Palace, St. James Garden, Covent Market, and Trafalgar Square. Robin, our tour guide did an excellent job of combining humor and history. The rain began to fall as we began the tour and steadily increased in intensity until we ended 3 hours later in a downpour at Westminster Abbey. A hot meal in nearby pub took the chill off nicely. With a full belly, I decided to visit the National Gallery, where I saw works by Van Gogh, da Vinci, Bruegel, Cezanne, and others. 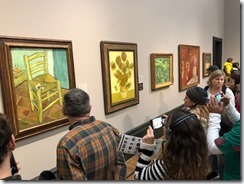 Like most museums in London, the National Gallery offers free admission, with a suggested (but not required) donation. I could easily spend an entire day at the Gallery, but a couple hours sufficed on this day. I walked around the city about more, passing through Leicester Square and Chinatown before heading back to my hotel. My new manager is based in the UK, so he drove to London Tuesday evening and I had a chance to meet him face-to-face for the first time. After we parted, I decided I needed to experience one more English beer in one more English pub before checking in for my final night and my flight home. I chose the White Hart, which bills itself as "The Oldest licensed premises in London", where I sat in a corner, sipped a lager, and read a couple chapters of "Brideshead Revisited". It was a whirlwind trip, executed in a short time with a minimum of planning, but it was well worth the effort. I hope to return soon. By default, Azure Functions are stateless, which makes it difficult to create complex workflows with basic Azure functions - particularly long-running workflows, such as those that require human interaction. 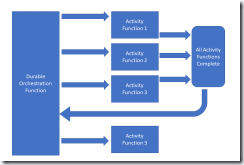 A Durable Azure Function maintains state for a long time, without having to stay in memory, making it ideal for orchestrations. Stateful information is stored in an Azure Storage Account when the the process terminates. This saves you money, because the default pricing model for Azure functions only charges you while the function is running. A Durable Function is not triggered in the same way as other Azure Functions (via HTTP, queue, database changes, timer, etc.) Rather, it is called from a "starter" function, which can be triggered in the usual way. Rather than placing all logic within a single Durable Function, it usually makes more sense to split tasks into individual Activity Functions and have the Durable Function manage these. The most simple Durable Function would simply call multiple activities in sequence. A diagram of this is shown in Fig. 1. 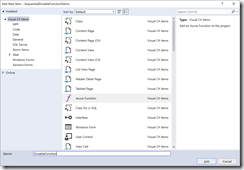 You can create a Function App for an Azure Durable function in Visual Studio in the same way you create any function - by selecting File | New Project from the menu and selecting "Azure Functions" from the Project Templates dialog, as shown in Fig. 2. Select "Azure Functions v2" from the top dropdown and HttpTrigger" from the list of templates, as shown in Fig. 3; then, click the [OK] button to create the solution and project. The new project contains a function named "Function1". Right-click this function in the Solution Explorer and rename it to "StarterFunction", as shown in Fig. 4. Now, you can add a Durable Function to the project. 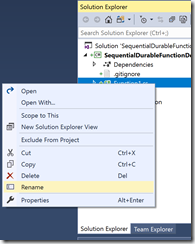 Right-click the project in the Solution Explorer and select Add | New Azure Function from the context menu, as shown in Fig. 5. Name the new function "DurableFunction1", as shown in Fig. 6. At the next dialog, select "Durable Function Orchestration" from the list of triggers and click the [OK] button to create the function, as shown in Fig. 7. As you can see, each function essentially does the same thing: log a brief message; wait 10 seconds; then, return a string consisting of the string passed in with a bit more appended to the end. Notice also that the "msg" parameter in each function is decorated with the [ActivityTrigger] attribute, which is what makes each of these an Activity Function. The Task.Delay() simulates a long-running activity. Imagine an activity that requires human input, such as a manager navigating to a web page and filling out a form. It might take days or weeks for this to happen. We certainly would not the application to continue running during this time: This would be an inefficient use of resources and it would be expensive. Durable functions handle this by storing state information in Azure storage; then retrieving that state when the function needs to resume. In Listing 4, we see that the Durable Function calls the 3 Activity functions in order. It passes to each Activity Function the output of the previous function. At then end of the orchestration, we expect to see a concatenation of messages from each of the 3 Activity Functions. Notice also the parameter of type DurableOrchestrationContext, which is decorated with the [OrchestrationTrigger] attribute. This identifies this as a Durable Orchestration Function. 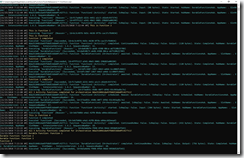 To see this in action, compile and run the project. A console will display similar to the one in Fig. 8. You can trigger the StarterFunction by issuing an HTTP GET to the URL displayed in the console (in this case http://localhost:7071/api/StarterFunction). Open a browser, enter this URL into the address bar, and press [ENTER]. Watch the console. You should see the log statements in each of the functions display in turn. Finally, we will see the final value of the msg variable after being passed to all 3 Activity functions. The output should look something like fig. 9. This illustrates the concepts of a Durable Orchestration Function. 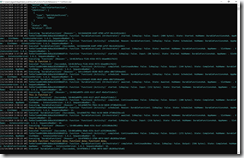 You can view the source code in the SequentialDurableFunctionDemo project at my Azure-Function-Demos GitHub repository. Learn how to create a Logic App to deploy a workflow in the cloud. 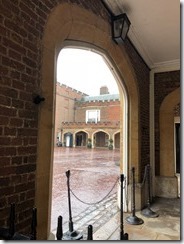 In previous articles, I showed how to create Azure Function Apps and Azure Functions directly in the Azure Portal. 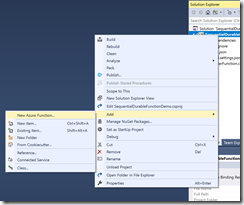 You can also create Function Apps and Functions in Visual Studio and then deploy them to Azure. I prefer to do this, because it makes it easier to get my code into source control. Before working with and creating Azure artifacts in Visual Studio, you must install the Azure tools. To install these tools, launch Visual Studio installer and check "Azure Development, as shown in Fig. 1. Once the Azure tools are installed, launch Visual Studio and select File | New | Project from the menu, as shown in Fig. 2. In the "New Project" dialog, expand Visual C# | Cloud in the left tree and select "Azure Functions" from the list of templates; then enter a project name and location, as shown in Fig. 3. The next dialog (Fig. 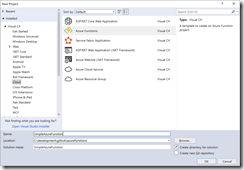 4) presents a list of options for your Azure Function. In the top dropdown, select "Azure Functions v2". Select "Http Trigger" to create a function that will be triggered by an HTTP GET or POST to a web service URL. At the "Storage Account" dropdown, select "Storage Emulator". This works well for running and testing your function locally. You can change this to an Azure Storage Account when you deploy the Function to Azure. At the "Access rights" dropdown, select "Function". 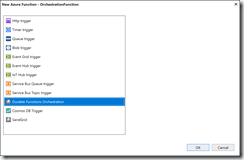 Click the [OK] button to create an Azure Function App with a single Azure Function. The method is decorated with the "FunctionName" attribute, which provides the name of the function. This tells the system that the Function is triggered by an HTTP request and that it will request either a GET or POST verb. We also pass in an ILogger, so that we can output debugging information. Log some information, so we can confirm the function was properly triggered. If a "name" parameter is passed in the querystring, capture the value of this parameter. If the "name" parameter was passed in the querystring, use that; if not, look for it in the JSON object from the request body. If a "name" parameter was found, return an HTTP Response Code 200 (OK) with a body containing the text "Hello, " followed by the value of the name. If no "name" parameter was passed, return an HTTP Response Code 400 (Bad Request) with a message into the body indicating a name is required. 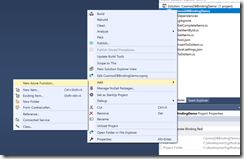 One quick way to publish a Function App to Azure is directly from Visual Studio. To do this, right-click the project in the Solution Explorer and select "Publish" from the context menu, as shown in Fig. 5. The "Pick a publish target" dialog displays, as shown in Fig. 6. Check the "Run from ZIP" checkbox. 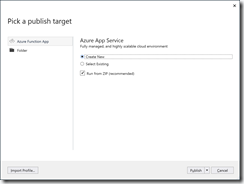 Select either the "Create New" or "Select Existing" radio button, depending whether you wish to deploy to an existing or a newly-created Azure Function; then click the [Publish] button. The follow-up dialog if you select "Create New" is shown in Fig. 7a and for "Select existing" in Fig. 7b. Click the [OK] or [Create] button at the bottom of the follow-up dialog to deploy the Function. 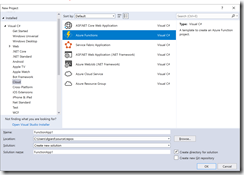 This article showed how to create an Azure Function App in Visual Studio, making it easier to test locally and integrate your code with source control. Jeff Fritz uses twitch.tv to live stream while he codes with others. He talks about how, why, and when he does it. I was a member of the Great Lakes Area .NET User Group (a.k.a. GANG) for years and spent some time on the board, including 2 years as President. But I've had much less interaction with them since joining Microsoft and moving to Chicago in 2014. So, I was excited when my friend Ondrej called to tell me that GANG was hosting a conference and I could speak there if I wanted. I wanted to be a part of this event, so I made the trek from back to Detroit. The event was held at the Microsoft offices in downtown Detroit. About 70 people came to hear a presentation on both technical topics and soft skills. Cassandra Faris opened the conference telling people how they can manage and promote your personal brand. J Tower was next with a presentation on how to use .NET Standard to share code among different types of applications and platforms. 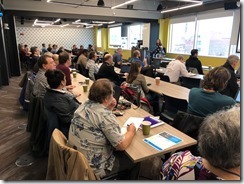 I wrote a presentation about Azure Functions and delivered for the first time at this event. Kevin Davis's presentation titled "Living your Best (Developer) Life" talked about how to choose and manage your career. Aydin Akcasu had the best demos of the day, showing Bluetooth devices integrating with the Chrome web browser. Finally, Daniel Davis described the benefits of clean code and how to achieve it. The event reminded me of a similar Saturday event I hosted to celebrate GANG'S 10-year anniversary back in 2011. This is the second year in a row, GANG has held GANGConf and president Ryan Albertson promised to do it again next year. I hope to be there again for it.